Rihanna features on the cover of Marie Claire UK December. 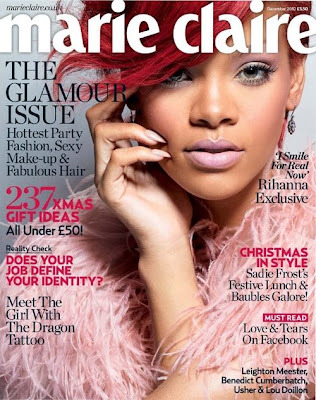 Newsstand cover features the Barbados singer in a beauty shot and for the subscriber cover a full length shot showing her great curve and intense red hair. Love love love the newsstand cover, but I'm not feeling the 80's wide hairdo. She looks hot either way though.